When I leave home, it’s as if I’m an entirely different person with an entirely different life. My thoughts are clearer. My experiences seem purer, unclouded by the things I own and do at home. When I’m in another country, everything I have fits into a 46-liter backpack. I’m not burdened by an apartment full of stuff. I have no pressing engagements and no deadlines. Nobody expects anything of me. Frequently, I’m surrounded by a language I don’t understand — or understand at the level of a child. Because of this, I’m immune to advertising. I can’t be affected by the news, good or bad. I buy only what I need — toothpaste today, a notebook tomorrow — and am blissfully unaware of the world at large. I exist only here. Only now. Because the baggage of daily existence has been stripped away, I’m better able to focus my attention on each moment. There’s less for me to have to worry about, which allows me to feel more in control. When I travel, I enjoy life more. I see more. I feel more. This enjoyment is intensified when my travels take me outside into nature, when I get an opportunity to hike or raft or play in the physical world. In 2011, I visited Peru and Bolivia for several weeks. Much of that time was spent trekking through the Andes. Walking with two dozen strangers, I carried my pack through green meadows, alongside slow-moving streams, and over snowy mountain passes. The trek was difficult but rewarding. I was in peak physical condition, which allowed me to meet the challenges presented by the high altitude and steep trails. Some of my companions became sick. Though I once twisted my ankle, my general good health granted me a sense of control over the experience. 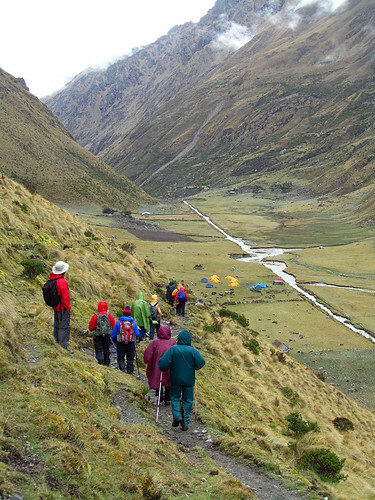 Each day, our guide led us on a clearly defined route; the ancient Incan trails helped us stay on course. Hiking through the jungles and mountain meadows, I enjoyed one of the best periods of my life. As my body strained to carry me across the Andes, I concentrated on the path in front of me. My steps became automatic. My sense of self melted away so that I gradually became one with my environment and with the trail. I’d found flow, that state of “optimal experience”. 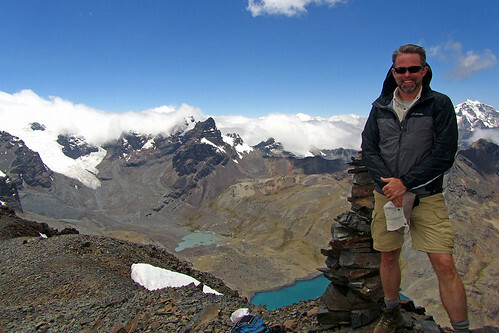 At 5350 meters in the Bolivian Andes — a peak experience. This is a fantastic description of the rewards of travel. Makes me nostalgic for my one real international trip so far to Mexico (not Cancun :) ). My wife and I really want to take a trip to South America soon (Patagonia in Chile, also maybe some other places such as Peru), but we struggle with deciding whether to invest the money instead. Thankfully Oregon provides a lot of mini travel experiences without the expensive plane tickets and time off from work. Anyway, thanks for sharing…. nice reminder of why travel can really be a worthwhile experience. Now, when anyone asks, I can just point them here. My last trek was last year, we really had a great experience. This summer I’m planning to join a trek, I know it’s not easy, but when reaches the top, everything would be worth it! It sounds like you experienced The Power of Now. Being in the moment is so powerful. That is when I feel most alive. Worry dissolves, the usual day-to-day preoccupations seem irrelevant. It’s a wonderful state of being. But if everything goes as per plan, I will soon be financially independent and will leave the full time corporate job.